China's factory inflation eased in October owing to slackening demand and a trade war with the United States, while consumer price inflation held steady, official data showed Friday. The producer price index -- an important barometer of the industrial sector that measures the cost of goods at the factory gate -- decelerated to a 3.3 percent on-year rise in October. It ticked downwards for the fourth consecutive month, from a high of 4.7 percent in June, while remaining in line with the forecast in a Bloomberg News survey. "China producer's inflation is cooling as manufacturing activity is receding damping price pressures on raw commodities, yet another casualty of US-China trade wars," said Stephen Innes, head of Asia-Pacific trade at OANDA, a foreign exchange trading platform. "The decline in the PPI underscores increased economic pressures." Analysts forecast price increases would remain subdued in the months ahead even as Beijing lets up on its campaign to battle winter pollution. "We expect the downtrend in PPI inflation to continue in a milder manner through winter given a less severe anti-pollution campaign this year compared to last," said Lu Ting, economist at Nomura bank. 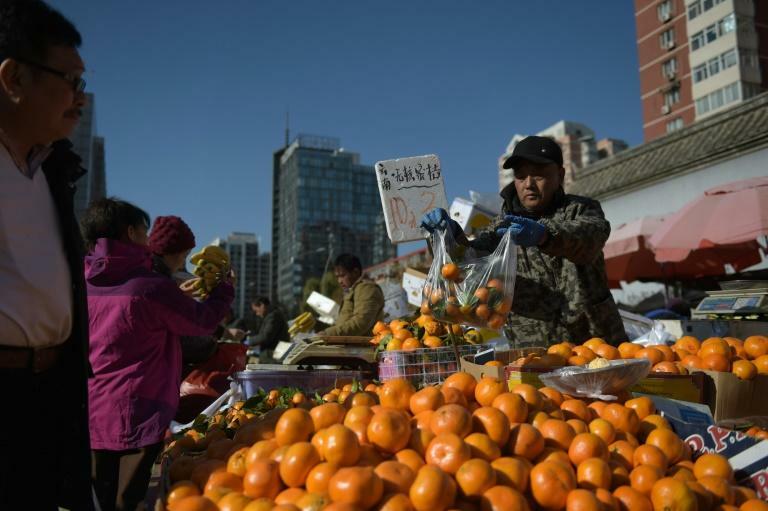 Pricey fruit, vegetables and oil once again held up China's inflation rate in October. The consumer price index (CPI) -- a key measure of retail inflation -- rose 2.5 percent, the National Bureau of Statistics said. The price jump, similar to the September figure, was in line with economist forecasts and comes in well below Beijing's targeted ceiling of three percent. "Food price inflation moderated, despite supply disruptions caused by flooding and the outbreak of African swine flu, which continued to push up both fruit and pork price inflation," said Chang Liu, China Economist at Capital Economics. Adding to the strain on consumers, the cost of diesel and gas each jumped more than 20 percent from last year, and rose more than four percent from last month. With oil priced in dollars fuel imports have become increasingly pricer this year as the yuan has weakened markedly against the greenback.